If you are looking for facial rejuvenation, but are not ready for a Facelift, a mini-facelift might be the right procedure for you. Mild to moderate lines can be improved with dermal fillers (Restylane®, Juvederm®, Perlane® and Radiesse®), but loose skin needs something more. If fillers aren’t filling like they used to, it might be time to consider a little nip and tuck. For the right patient, a mini-facelift can provide big results in a mini package. Before a Full Facelift - The skin of the lower face and neck is loose, and the anatomic definition between the face and neck is lost. After a Full Facelift - The skin of the lower face and neck is firm, and the anatomic definition between the face and neck is restored. The Traditional Facelift is the gold standard of facial rejuvenation. It can correct more aspects of the aging face, and can do so to a greater extent, than the mini-facelift. Severe skin laxity, platysmal banding and sagging of the cheek fat pads can be quickly and accurately improved with a facelift. While a facelift does more, and lasts longer, it requires more downtime for recovery. A facelift also takes longer, requires more anesthesia and accordingly costs more. The patient shown above had a full facelift with upper and lower eyelid surgery. 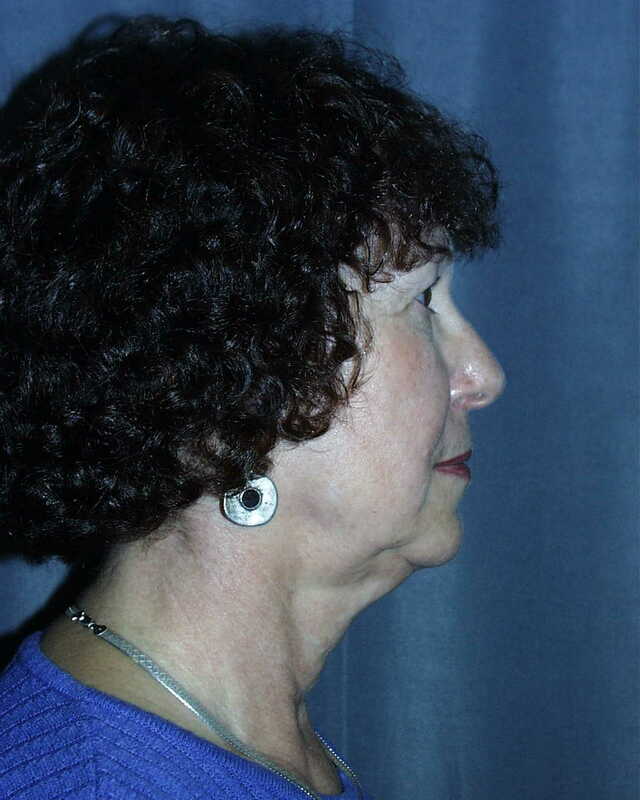 Mini Facelift Before - Loose skin on the lower face and neck obscures the jawline. Mini Facelift After - The jawline is clean and the jowls are removed. If your primary problem is mild to moderate skin laxity, and the structures underneath the skin are in good shape, a Mini-Facelift may be able to get you the younger, rested look you want. A mini-facelift is a shorter procedure, which can be done under local anesthesia, resulting in a quicker recovery and a lower cost. The mini-facelift is great for early intervention, and while it cannot replace a full facelift in terms of the amount it can do, or how long it will last, it can significantly delay the need for a full facelift. A mini-facelift can also be used to rejuvenate a previous facelift, with relatively less effort. The patient shown above had a mini-facelift with lower eyelid surgery. Many brand name mini-facelifts have recently emerged (and died): The Lifestyle Lift™, QuickLift™ and NewLift™. They try to keep the techniques secret (even from their patients), but they are essentially mini-facelifts. The companies that market the lift will train a doctor to perform the procedure for a price. They have tried to carve out a niche in the Cosmetic Plastic Surgery Market with a gimmicky name and massive advertising, but buyer beware. When you are purchasing a mini-facelift you are not just purchasing a one-size-fits-all procedure; you are purchasing the skills of the individual physician performing your surgery. There is nothing magical about a Lifestyle Lift™, QuickLift™ or NewLift™. It is a mini-facelift, and at a minimum, you will want to check for yourself the ABMS Board that has certified your potential surgeon (see links at the bottom of this article). When you check, you will find, most Board Certified Plastic Surgeons do not perform brand name lifts. Most Board Certified Plastic Surgeons do, however, offer similar procedures at a competitive rate. The American Society of Plastic Surgeons (ASPS) and the American Society for Aesthetic Plastic Surgery (ASAPS), find it unethical for a plastic surgeon to patent a procedure. Instead, new techniques are freely shared and discussed at our professional society meetings. This is how we reinvest in our profession, and allow the practice of plastic surgery to grow. Board Certified Plastic Surgeons learn how to do facelifts and mini-facelifts during years of training, and continue to refine their technique with practice, continuing medical education and instructional courses. I find that one facelift technique is not enough, and I would rather tailor your facelift to the specific needs of your face.